This story by Texas Tribune urban affairs reporter Brandon Formby was produced in partnership with Curbed for The United States of Texas and California. Charlie Calhoun steered his green four-wheeler past the ponds where his 5-year-old boys love to fish, wove around dozens of cattle that lounged beneath pin oaks dotting the 630-acre ranch, and headed back to one of their barns. His wife’s parents own the ranch in lush, rural Grimes County, nestled between Texas A&M University and Sam Houston National Forest — and about two hours northwest of downtown Houston. Charlie and Randa put a mobile home near her parents’ house on the ranch and have spent almost a decade saving money to build a house of their own. They have a spot picked out near the pen barn, where their cattle are picked up by meatpacking companies that eventually turn the cows into beef that’s sold across the country. But those plans are on hold. By the time they’d saved enough, they learned their land was in the path of a proposed high-speed rail line that aims to run America’s first bullet trains. Texas Central president Tim Keith told the Tribune in February that trains could start running around 2024. The company is embroiled in legal and bureaucratic debates about whether a private company can use eminent domain, a process that allows entities to condemn land they need for a project and forcibly buy it from owners who aren’t willing to sell. “When those boys are sipping martinis on the weekend, we’re working cows,” Charlie Calhoun said. Randa Calhoun’s parents, George and Doretta Finch, became teachers after her dad’s career on the rodeo circuit. 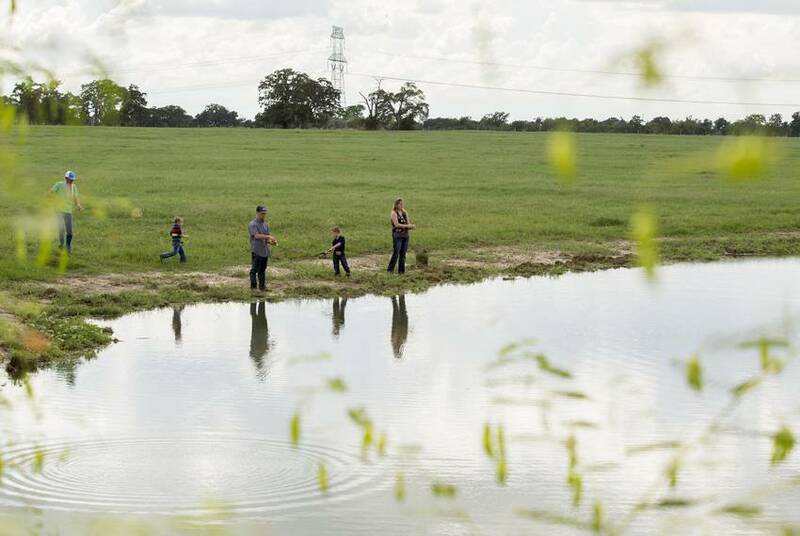 They raised their two children in La Porte, a bedroom community outside Houston, and spent decades saving enough money to buy land where they could retire and raise cattle. Charlie and Randa Calhoun met as competitors in high school pig-raising contests and married in 2009. He’s a salesman for Pioneer Steel and Pipe. She’s a licensed specialist in school psychology. Shortly after their wedding, they moved into the mobile home on the ranch, and since then, both generations have put up barns, cleared pastures and raised livestock. “It’s something that was built with the plan of passing it down and being in our family,” Randa Calhoun said. The Calhouns wanted their two sons, Cainen and Cash, to grow up learning the value of living off their own land and raising the food they ate. Despite the pop culture archetypes of Texas that feature oil men and cattle drives, the Calhouns have become a minority in Texas, which is now home to five of the 15 largest cities in America. About 150 miles north of the Calhoun’s ranch, Dallas-Fort Worth now has 7.4 million residents. About 95 miles south, the Houston area is teeming with 6.8 million people. Each region is expected to have more than 10 million residents by 2050. With all the growth, the state’s transportation budget hasn’t kept pace despite the Texas Department of Transportation’s biennial budget of more than $26 billion, the overwhelming majority of which goes to road and highway projects. So state leaders have increasingly turned to private companies for help. For years, that meant giving controversial contracts to private companies to front the construction costs of highway expansions — the state allows the companies to put tolls on the new lanes and keep much of the profits. But as political support for tolls waned amid public backlash, lawmakers created a welcoming environment for private companies that have made Texas their laboratory for other mobility experiments: The Dallas suburb of Frisco has the nation’s first self-driving car network, and Uber picked North Texas to pilot flying vehicles. Texas law allows railroads to use eminent domain to take land for projects. But opponents frequently argue that Texas Central doesn’t count as a railroad because it’s not currently operating any trains. Company officials counter that the $125 million they’ve already spent developing, designing, and seeking federal approval constitute operations. “Private companies have been building infrastructure since the beginning of our country,” says Reed, the Texas Central executive. This specific debate has been at the heart of legal battles for years: Texas Central has sued several landowners who wouldn’t agree to let the company survey their properties. It settled more than 20 of those cases and dropped more than a dozen others as the 2017 legislative session was gearing up. But there’s yet to be a definitive ruling that explicitly allows or precludes Texas Central from condemning land. In 2016, Texas Attorney General Ken Paxton declined to weigh in on the matter because of a pending case in Leon County. That’s where James Miles sued the company after it sought to survey his property, part of which is in the path of the planned line. Both sides are waiting for a state district judge to either decide the issue or call for a trial. It’s become a closely watched case among rural landowners. Their boys were still babies when the Calhouns first learned from a neighbor’s Facebook post that a train could be coming through Grimes County. Randa Calhoun started researching the project, and, during the 2015 legislative session, went to Austin and heard a Texas Central official testify that the company had been talking to different government agencies about its plans for years. In neighboring Waller County, just to the south of Grimes County, Donovan Maretick found out about Texas Central’s plans when a man asked him for permission to survey his land. Maretick lives in Cypress, northwest of Houston, but bought the rural property so that his son, who has autism, would have a peaceful place to live. When Maretick wouldn’t agree to the survey, the company asked if he’d discuss a land option agreement, in which Texas Central would agree to a sales price — based on factors including market value and the impact on the remaining property — pay a portion up front and only take the land and pay the remaining portion if the project goes through. But Maretick, like many, simply has no interest in selling his property. Texas Central says it’s only going to need portions of many properties. 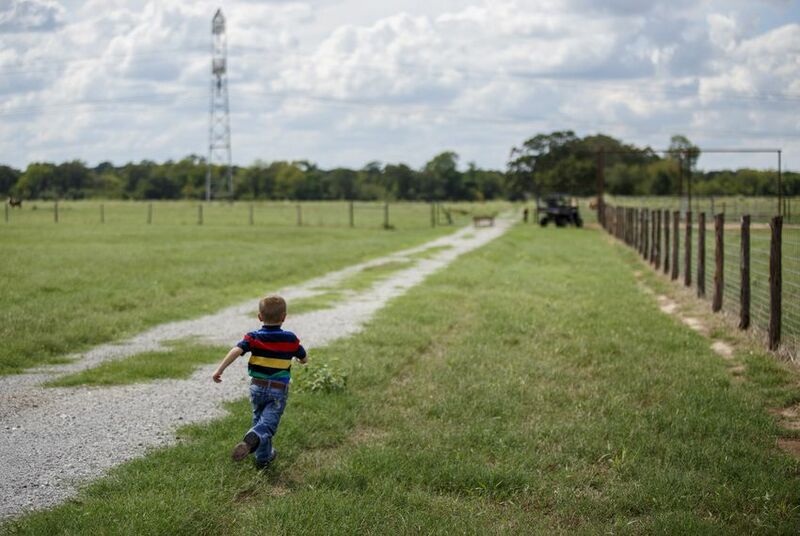 For the Calhouns, it’ll likely be a long strip that runs across a back pasture, right next to a row of power lines that already cuts through their land. Much of the planned line will be elevated on viaducts or earthen berms because the starts and stops that would come with intersecting roadways and other tracks would impede top train speeds. The berms, in particular, worry farmers and ranchers because they’ll form physical barriers for livestock, tractors and other equipment. They argue that putting a berm through a property will hurt its value by splitting it into two separate tracts. The Calhouns don’t know if Texas Central has berms or viaducts planned for their ranch. That may be because, like many project opponents, they haven’t allowed the company to survey their property. 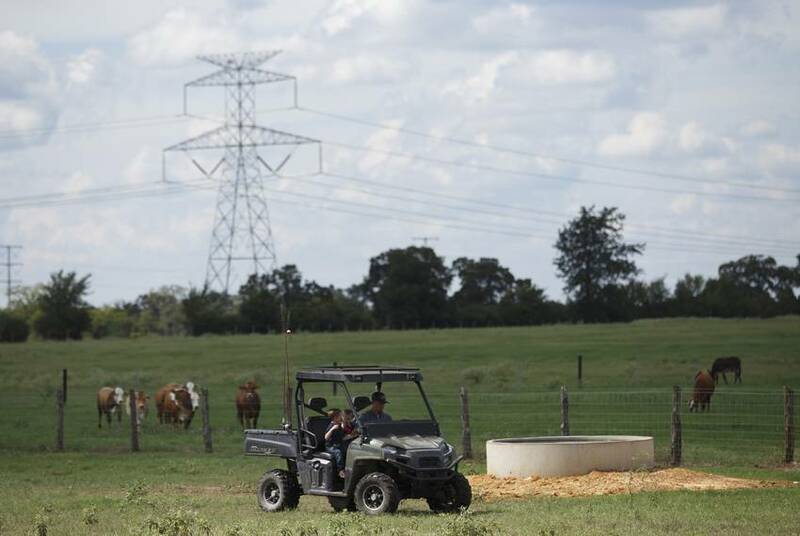 Texas Central announced last year that more than 3,000 people and businesses agreed to have their land surveyed, but officials have declined to comment on how many more survey agreements they need. “The thought of the unknown, of what it looks like when it comes through our property, is just devastating,” Randa Calhoun says. Reed, the company executive, said they talk extensively with homeowners about how Texas Central can minimize the impacts of the project. For example, it has promised to add pass-through culverts for livestock and farm equipment in portions that will be bermed. “It’s a very personalized conversation because everybody’s situation is different,” Reed says. Meanwhile, the company won’t specify how much money — out of its $15 to $18 billion project costs — it has spent on the land purchase agreements it’s already secured, or what percentage of the track length has been procured. The Calhouns say it doesn’t matter what Texas Central promises: They and most of their neighbors aren’t budging. 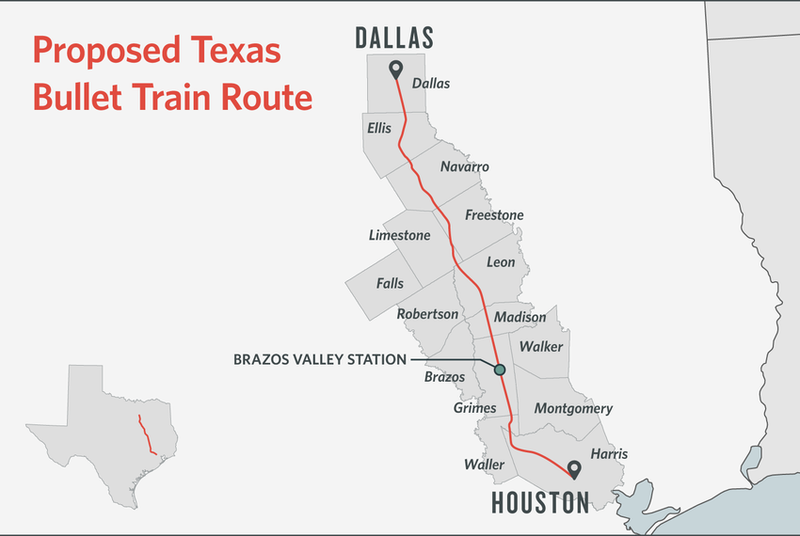 In Dallas and Houston, officials and business leaders have cheered the project and the economic development Texas Central promises to spur with construction of its stations. The Dallas terminus of the high-speed rail line will sit just south of downtown in a burgeoning neighborhood called The Cedars. Texas Central leaders plan a massive mixed-use development in and around the station that they promise will spur even more growth in the area. Supporters are hopeful that it will extend downtown’s economic center of gravity to the south, toward a corner of downtown where a small handful of owners have large parcels ripe for a massive development project — such as the nationally hyped second headquarters for Amazon, which has named Dallas a finalist city in its search for a new home for 50,000 employees. “You have tremendous development opportunity there, for both more transit connections and potentially one of these big corporate relocations that we’ve been looking at,” Kourtny Garrett, president and CEO of Downtown Dallas Inc., told a group of officials and civic leaders last month. The midpoint station would be near an unincorporated Grimes County crossroads called Roans Prairie, whose major landmarks are a convenience store and a mobile home sales lot. It would be aimed at serving Texas A&M and Sam Houston State universities, both about a 30-minute drive away. Still, Texas Central thinks the station would also be able to support new development. Houston’s station will be about seven miles northwest of downtown at the site of a partially shuttered shopping mall. Texas Central envisions another mixed-use project there, large enough to draw an influx of other developments into a neighborhood currently dominated by industrial offices and warehouses. Christof Spieler, an engineer and urban planner who just ended an eight-year term on the board of Houston’s transit agency, said the stations are likely to draw the kinds of crowds that keep retail businesses alive. And, he said, it will make areas that seem undesirable now suddenly very attractive. Dallas and Houston each have public transportation agencies that run buses and light-rail trains across the sprawling regions. The proposed Dallas bullet train station is about a 15-minute walk from two existing downtown light-rail stations, though that requires pedestrians to traverse bridges over a highway that separates downtown from The Cedars. The Houston bullet train station is about a mile from the closest major bus station. The region’s light-rail network doesn’t come anywhere near the planned high-speed rail terminus, leaving many project critics skeptical that people will want to ride the trains if there’s still another 30 to 60 minutes at the end of the trip. 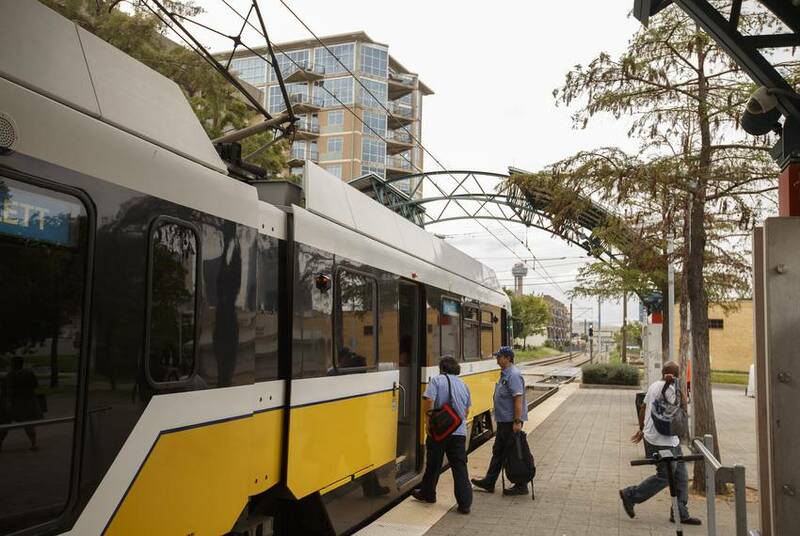 Reed, the Texas Central executive, said the company plans to provide passengers with as many transportation options as possible — from public transit and rental cars to shuttles — once they get off the trains. But details of how that will all work are yet to be finalized. “We know we need to get you to your ultimate destination seamlessly,” she says. Just outside Bedias, a new convenience store sells live fishing bait and offers up boiled peanuts kept warm in two crock pots. Off a dirt road not too far away, on a recent Saturday in September, the Calhouns tended to chores on land where the traffic and noise of Houston seem a world apart. Throughout the day, the boys repeatedly asked if they could stay up late that night. A sow was farrowing — on the cusp of giving birth to piglets — and Cainen and Cash wanted to help. “We’ve made tons of memories on our land with our boys,” Randa Calhoun says. They wonder how many more memories they’ll be able to create here. Editor's note: This story is not available for republishing by Texas Tribune media partners. Texas bullet train firm calls provision added to budget a "job killer"